FrostaLife™ is a solution optimized for the cryopreservation of mammalian cells by Lifeline® cell culture experts. Simply count your cells, centrifuge them and resuspend the cell pellet in the desired volume of FrostaLife™ and dispense into cryopreservation vials. 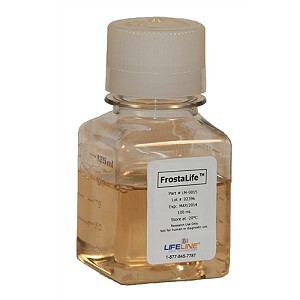 FrostaLife™ is a ready-to-use 100 mL freezing reagent containing DMSO and fetal bovine serum. FrostaLife™ contains no antimicrobials and no phenol red. Lifeline® Cell Technology manufactures our cell freezing solutions using the highest quality raw materials and incorporates ISO- style quality assurance in every production run. Exacting standards and production procedures ensure lot-to-lot consistency. FrostaLife™ cryopreservation solution is extensively tested using human melanocytes. 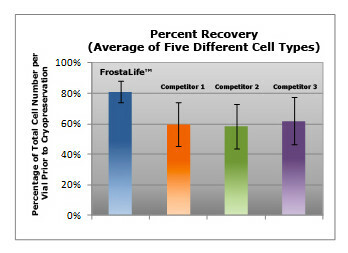 In comparisons with other commercially-available cryopreservation solutions, FrostaLife™ shows better post-thaw viability and cell reattachment, and better overall recovery (fewer lysed/destroyed cells). Shown left: Average recovery of cells after cryopreservation: Human Epidermal Keratinocytes, Human Dermal Microvascular Endothelial Cells, Human Mesenchymal Stem Cells, Human Epidermal Melanocytes, and Human Umbilical Vein Endothelial Cells were cultured and cryopreserved in various cryopreservation solutions. After thawing the vials, cells were counted and the total number of cells (viable and non-viable) was compared to the total number of viable cells that were dispensed prior to cryopreservation. 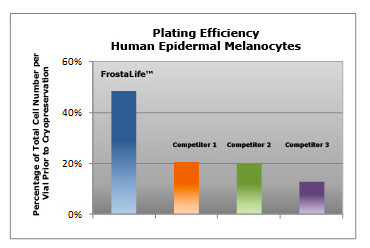 Shown above: Post-thaw plating efficiency: Human Epidermal Melanocytes, were cultured in DermaLife M Medium and cryopreserved in various cryopreservation solutions. After thawing the vials, cells were counted and inoculated into flasks. The following day, the cells that had attached were removed from the flask and counted. This value was compared to the total number of viable cells inoculated.